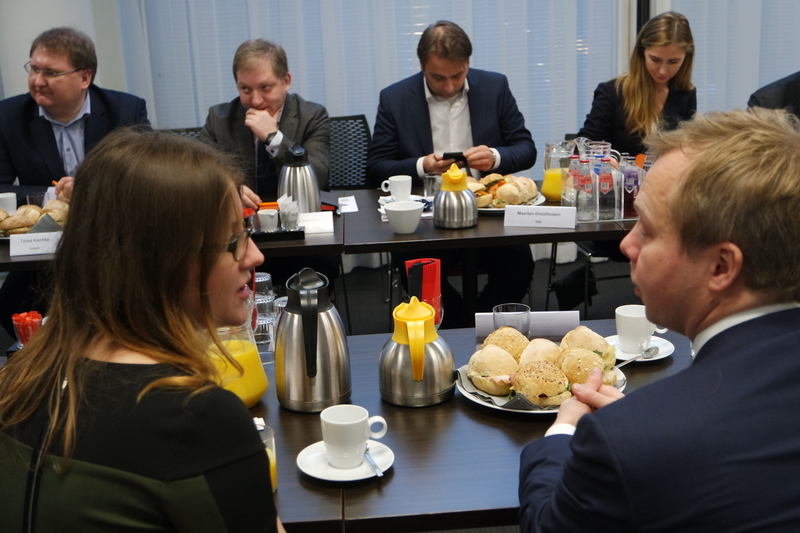 A delegation of politicians and civil society organization (CSO) leaders from Georgia and Ukraine visited The Hague this week as part of a programme designed to enhance cooperation and policy awareness. The delegates met with Dutch MPs, Ambassadors, and representatives of the Ministry of Foreign Affairs and NGOs to identify shared interests, exchange information and gain insight into the policy positions of the different countries. The visit culminated in a lunch and roundtable discussion with MPs and officials from both opposition and government parties from Georgia, Ukraine and the Netherlands on 20 December in Nieuwspoort. The debate focused on the theme of “Diplomacy, Security and Democracy”. Taking stock of trilateral affairs, including an exchange of opinions on the Fifth Eastern Partnership Summit. Security and Conflict Resolution, specifically Russian interference in Ukraine, Georgia and the Netherlands, and Russian propaganda and fake news. Democratic development in the three countries, including political reform and the political participation of women and minorities. The visit comes at a moment when both Georgia and Ukraine are actively seeking closer ties with the European Union. The two countries have signed both an association agreement and a trade agreement with the EU, and their citizens have been able to travel visa-free to the member states of the Union since earlier this year. These institutional frameworks ensure stronger political, economic and cultural ties but should, at the same time, be accompanied by strengthened bilateral relations. This visit, organized by NIMD and our partner the Eastern European Center for Multiparty Democracy (EECMD), therefore aims to contribute to more trilateral contact between the Netherlands and Ukraine and Georgia.